Royalwood™ Wallaba shingles cost generally about 40% more than Cedar, and being a hardwood, will outlast Cedar, and are naturally fire resistant, and mold and mildew resistant. It has dark reddish-brown color, and does eventually weather to a silver-gray coloration. 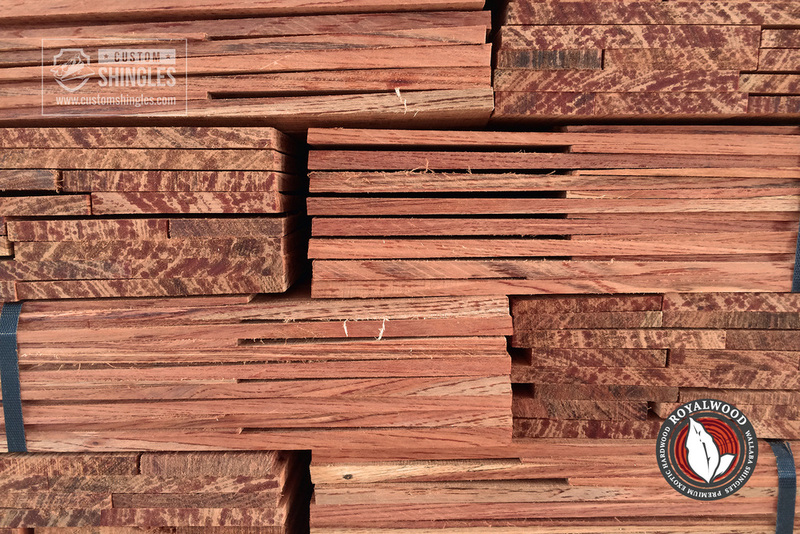 Royalwood™ Shingles and Shakes are made from Wallaba, a tropical hardwood. They are 100% clear, 100% heartwood, and are naturally resistant to insects and decay. The raw Wallaba shingles are milled in a state of the art factory in Guyana, and depending upon the project, shipped to our headquarters in Florida for finishing. Get started on your Royalwood Wallaba project by requesting a quote today. Our Royalwood™ Wallaba Shingles and Shakes are manufactured from some of the highest standards in the roofing industry. Wallaba Shingles are quickly becoming a hot commodity, and for good reason - They are highly regarded and specified by both architects and builders within the United States and worldwide and as such have been used for a variety of outstanding projects including a number distinguished hotels, resorts and villas in several locations such as the Caribbean, the Middle East and throughout the United States. Wallaba wood occurring as a dense tropical hardwood, and seen as reddish-brown to light red in its original color. It is recognized one of the most abundant timber species found in the country of Guyana, having a naturally coarse texture and typically straight grain.